Kirkintilloch Rob Roy are through to the last eight of the Scottish Junior Cup for the second year running after a remarkable fifth round encounter with Linlithgow Rose. In a match which had just about everything Stewart Maxwell’s side came from 3-0 down to KO the East Region side with a dramatic late winner. The visitors started the match with a bang and forced a corner in the second minute following an early free kick. The Rose attacking continued and they took the lead two minutes later when Roddy McLennan fired a right foot shot high into the top left-hand corner with Steven McNeil well beaten. The visitors dominated the first 10 minutes and their slick passing was causing the Roy a lot of problems. However McNeil’s luck was out as, when attempting to clear the resulting cross, he punched the ball in to his own net. Two minutes later Rose had the ball again in the net but it was disallowed for offside before the Roy had their first attempt at goal when Darren Hill palmed Gavin Mackie’s shot over the bar. Roddy MacLennan was causing the home defence all sorts of problems and they did well to prevent him scoring again in the 20th minute after a mazy run. But worse was to come for Rob Roy in the 29th minute when referee Doherty awarded Rose a penalty after Gary McMenamin handled in the box. Tommy Coyne made no mistake from the spot, blasting low past McNeil. A stunned Rob Roy then fought back in the 33rd minute when Mackie curled a free-kick from 20 yards high into Hill’s right hand corner to reduce the deficit. This inspired the home team and three minutes later referee Doherty awarded another penalty after Rose’s McKenzie was penalized for handball. Gary Carroll made no mistake as he sent Hill the wrong way and cut the lead further. In the 39th minute Rob Roy had a goal disallowed for offside but the home support had only three minutes to wait until Kevin Watt was able to slam the ball home following a knock down from a Mackie free-kick and square the match. The half-time whistle blew on an incredible 45 minutes - but there was no end to the drama as the second half continued in the same vein. In the 47th minute McNeil saved well from Roddy MacLennan before the Rose defence did well to clear from another Mackie free kick. Michael Morris did well to avoid a yellow card on the hour mark after a robust tackle on Blair Batchelor and two minutes later Lee Gallacher brought out a fine save from Hill as play flowed from end to end. In the 68th minute Coyne saw his shot crash off the bar before a low shot from Gallacher again brought out a fine save from Hill. The drama continued in the 71st minute when Rose’s Martyn Shields picked up his second yellow card for a needless foul and was shown the red card by referee Doherty. The Rabs then were able to take advantage of having the extra man and Scott Walker went close with a shot from the edge of the box. Nevertheless the visitors continued to be a threat and McNeil again did well to keep out a Coyne effort in the 81st minute. Two minutes later substitute Willie Sawyers released Gallacher and a last ditch tackle from Colin Leiper prevented the danger before the Rose broke upfield and McNeil did well to block Batchelor’s shot. In the 84th minute McNeil again saved from a one on one run from Batchelor and blocked the shot for a corner. Then at the other end Shaun Fraser’s shot went narrowly past Hill’s left hand post. As the match was drawing to a close Gallacher’s cross in the 89th minute was headed wide by McKenzie for a corner. The resultant cross was met at the back post by substitute Gary McCulloch and his powerful header back across the goal was touched into the net from near the goal line by the predatory Sawyers, sending the home support wild with delight. Shortly after referee Doherty blew the final whistle on an incredible match that thrilled the near 500 crowd. After a poor opening 20 minutes Rob Roy staged a remarkable comeback showing great determination and belief, which emphasized the great fighting spirit and togetherness within the squad. 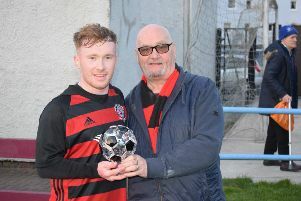 Sponsor Dougie McNichol presented the Supporters’ man of the Match trophy, kindly donated by Roddy the Dog Walker, at the end of the game to Gary Carroll.